I would argue that there is nothing more difficult than the first few months of being a first time mom. It isn’t like anything you’ve ever experienced before, & your body is flushed with hormones that seem to be working against you. Yes, practice. Just because they are called instincts does not mean that they are instinctual. Or perhaps they are, but we have just gotten really good at burying them deep beneath loads of theories from parenting forums & books. Practice listening to your baby’s cues. Practice going with your gut. Don’t force yourself into a parenting style that makes you miserable. Listening to yourself can be harder than you think… so keep practicing. I know that I just said to follow your instincts. However, hearing other people’s perspectives can help you a lot. Encourage close family & friends to share their stories of those first few months of motherhood with you without necessarily giving you advice. It meant a lot to me when my aunt told me about a time when she visited my mom after she had my brother, & she told me that she watched us kids while my mom napped. This simple story made me realize that my mom who I see as superwoman got tired too. She had help, & I deserve help too. When we are feeling unsure of ourselves, we tend to ask around for opinions in hopes that it will make us feel better about our decisions. However, I think that this method usually backfires, & ends up making us feel even more insecure. If the well-meaning stranger at the park asks how your baby is sleeping, you can lie & tell her that she is sleeping well even if she is up 20 times a night. Because chances are the stranger will not be giving you life-altering advice… they will probably tell you some strategy that you have to use because it worked for their child. Then you will walk away feeling like you are doing things wrong, & you may even feel obligated to try the stranger’s method & go against your own instincts. Mom friends are the best. Join a local mom’s group, head to the park, go to Target… they are everywhere. We are all looking for someone to connect with. Find a few moms that you can really connect with and that have a similar outlook on parenting as you do. As for the other moms? They can be great to chat with when you run into them, but don’t feel the need to go in-depth with every mom you meet. New moms like to complain, give advice and judge. Leave the processing and real conversation for your trusted mom friends and just give the other ones a gracious smile and nod. Keep in mind that perfect parenting does not necessarily result in a perfect child. And how many fantastic people do we know who had horrible parents? It works both ways, which means that we do not need to beat ourselves up so much over ever tiny parenting decision. Part of who our children will become is already etched into their DNA. I, of course, believe that parenting plays a huge role in shifting tendencies, but there is something reassuring in understanding that it is not 100% in our hands. Everyone is just doing the best that they can at that particular moment — including you. We have good parenting moments and bad ones… but the bad ones often come when we can’t muster up anything else. A bad moment doesn’t make you a bad parent. Try your best, try again, try to change. As long as you are trying to get better, you are on the right path. Change things that don’t work for you & cling to the things that do. 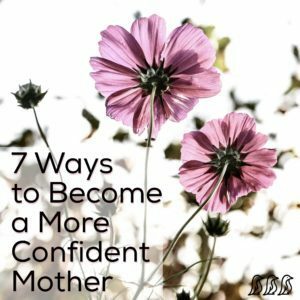 Work on being confident as a person, not just a mom. Motherhood consumes us, and I think that that is part of what makes it so beautiful. But if you were not confident in who you were before, motherhood will throw you for a loop. Find out your strengths, weaknesses, likes and dislikes as a person; then see how they transition to motherhood. Discover what you enjoy about yourself, and be sure to showcase that to the world.